I appreciate the opportunity to work with you as I know it takes great courage to open up and show your home to a stranger; especially the parts of your home that are disorganized. Working with me is professional and confidential. I hold the utmost respect for your belongings; I treat them as I would my own. Schedule an Initial Consultation. I will tour the spaces you'd like help with, we'll discuss your expectations and together we'll craft a vision. This visit will take about an hour or so, depending on the scope of your project. At the close of the appointment, I’ll provide you with a good faith time estimate, review my policies and rates and will email you the written plan that we discussed. I prefer to work with you, not for you. When we work together, I learn invaluable information about you that helps me organize systems and spaces that are tailored just for you; the habits you have, the way you think etc. There is also the assurance that you'll be able to maintain the organization that we set up, long after I have left. There is a 3-hour minimum so that significant progress can be made. It is important that our scheduled time be uninterrupted so that we may maximize our time together. All organizing projects require pre-payment. You schedule the dates on my calendar and your project becomes my priority at the pace you determine. 60 minute coaching sessions in person or through the phone/internet are offered for organization/maintenance to develop and ensure new systems allow you to work and feel supported in your space. Financial coaching using the principles from Dave Ramsey Solutions is also available to focus on budgeting, getting out of debt, and preparing for/enjoying retirement. All coaching sessions are pre-paid at scheduling. Chances are you already have a house cleaner, a lawn mowing service and a repair person to assist you in keeping your life running smoothly. 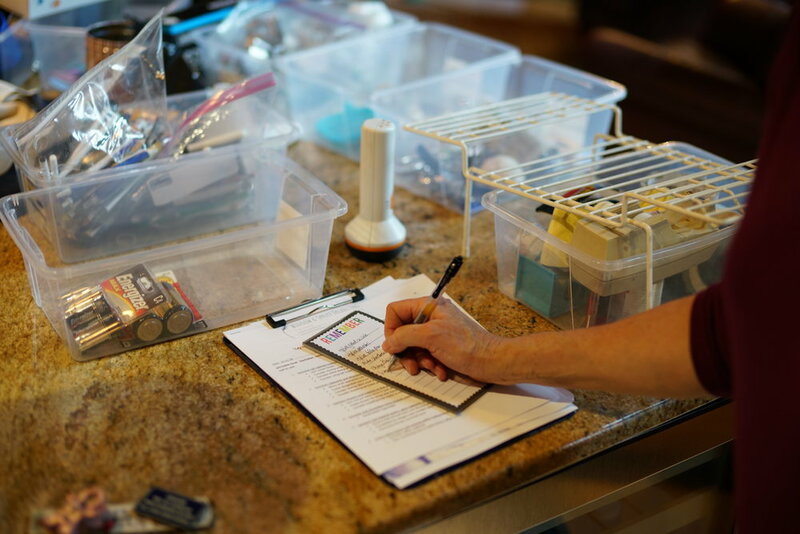 Adding a professional organizer to your lifestyle team can make all the difference as you work through getting all the areas of your home, personal and professional life organized. Set up a monthly subscription and auto-pay a discounted rate. Choices include: a 3 hour, a 6 hour work session, or a 1 hour coaching session once or twice each month. A limited number of subscriptions are available. It’s my pleasure to work on all types of projects. Entire houses with rooms including: kitchens, basements, bathrooms, bedrooms, living rooms, dining rooms, home offices, craft rooms, libraries, entry ways, laundry rooms, garages and even backyards. Small spaces such as closets, desks, pantries, playrooms. And special projects like setting up filing systems, organizing recipes for ease of meal planning, sorting photos and creating a home library. A 50 foot storage trailer with over 100 boxes was my largest project to date. I had it cleared out and organized in just 4 days! Do you have a project you'd like assistance with? Let's talk.